Big Band Library: Wayne King "Melody of Love"
He wasn't there, but the happiness and entertainment which saxophonist Wayne King is remembered for were very much in evidence the night of June 25th, 2004, when tiny Savanna, Illinois, situated alongside the Mississippi River, recalled the life and career of one of its native sons. 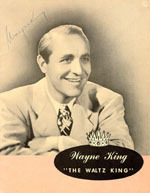 During his more than 55 years as a bandleader, Wayne King had tremendous success. It's heartwarming, therefore, what his wife, Dorothy, told me she considers to be King's crowning achievements. "His two children," she smiled. She has many favorite memories of her husband, but one stands out, above all. "Well, just that he was a happy person, really," she said. "He was very happy." What were his best qualities? "Honesty, mostly," she recalled. "And caring for other people." His son, Wayne Jr., found him an interesting man. "He wanted to be a very good musician, but he wanted to be a better entertainer," he said. "He wanted people to come to his events and be happy, and get the worries of the world off their shoulders. He wanted to provide the release. Remember, when he came up, he came from the Depression years, when people had so many worries." Garrod, Charles. Wayne King and His Orchestra (Zephyrhills, FL: Joyce Record Club, 1994). Law, Gary "Scott." Website, stevestevensorchestraproject.com. Popa, Christopher. Interview with Ed Bolton, Jun. 25, 2004. ---. Interview with Nancy Evans, Jun. 25, 2004. ---. Interview with Dorothy King, Jun. 25, 2004. ---. Interview with Wayne King, Jr., Jun. 25, 2004. 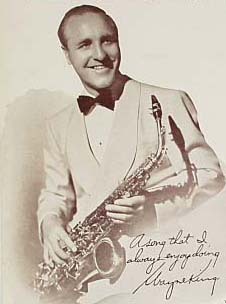 King's band often won popularity polls, and he received a Radio Guide Trophy in 1940 as "Radio's most popular dance orchestra for seven years." "I think it did please him; I don't think that was his goal," Wayne Jr. observed. "I think he appreciated the honor. He always appreciated those things. But his goal was still to entertain and make people happy." The broadcast series that helped to win him that award was "The Lady Esther Serenade," which aired from 1931 to 1937. "He was very, very picky who he allowed to sponsor him," Wayne Jr. noted. "He would not allow himself to be sponsored by any alcohol company. Not because he didn't drink; he did, in great moderation, by the way. But he didn't believe that he wanted to represent this to younger people. So he turned down many, many offers of big companies that he just didn't think was appropriate for him to represent to his fans." 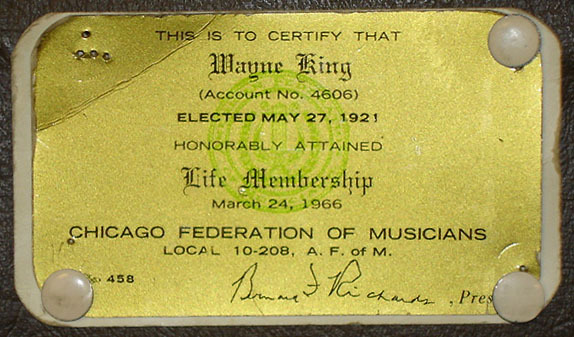 In 1964, King was invited back to the Aragon in Chicago for the final time, to close it. The audience, understandably, was a mixture of nostalgic and sad. "I don't think he was sad," Wayne Jr. commented. "My dad was a realist. He realized that times change. I think if there were sadness, it's because there were so many wonderful, wonderful times there, but I think he realized that the world has to go on and things happen. So he was honored to close it. That was a wild, wild night. I was very young those days and to get in the ballroom, I had to give... we had a party of about ten people... had to give each one of them an identification card of mine so they could put up at the door so they could get in, because there were just mobs of people. It was just an amazing experience." "I loved it and we got to see so many of our friends," Nancy Evans related, with no sadness. "No, no, because I knew it wasn't the end of our working. We just weren't gonna be there. And then [into the 1970s] we started to go out on wonderful, wonderful tours . . . sometimes we'd play for a dance, sometimes for a concert, sometimes for both." Thousands of people regularly enjoyed his music at the Aragon Ballroom in Chicago, so, appropriately, the setting was a sold-out dance, organized by a local resident and fan, Gary "Scott" Law. Special guests included members of King's family and two of his former singers. 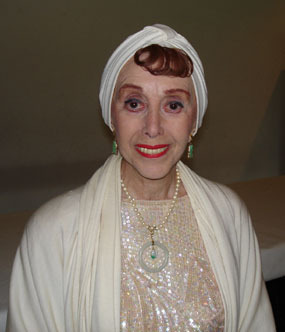 One of King's featured vocalists, Nancy Evans, explained that, prior to joining his band in 1945, she hadn't heard of him. "No, I didn't know who he was," she stated. "I had no idea, but my mother, when I came home and said, 'I'm going to audition for a Mr. - uh, let's see, what's his name?' and I told her, she said, 'Oh, I love him!' She played him every night." Nancy enjoyed being part of King's tv show which originated in Chicago. "I said, 'Oh? Television?' I didn't know what, nobody knew what television was," she chuckled. "This man was the most wonderful person, and he brought television in the way it should be. We had beautiful shows." How much choice did he give her in the songs she sang? "He was very generous with me," she said, "because I usually did exactly what he wanted. And he had a certain style, and that's the way he wanted it. And I thought, 'Well, ok, I don't have any style, like a lot of singers.' I always thought, 'I just sing,' because I love to sing. And so I would sing sweetly, which is what he wanted. And the tv show was going to be a family show, so we closed the show with a... not, I wouldn't say it was a hymn... but it was a hymn song . . . and I loved singing it." 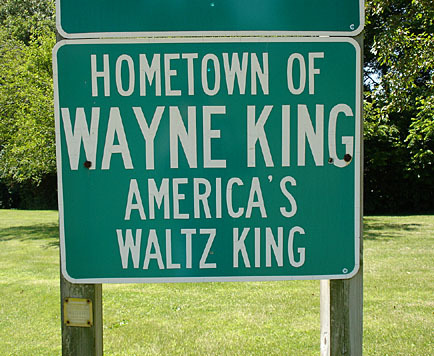 Almost two decades following King's death, while his music still conjures up pleasant times for members of the public, Wayne Jr. remains able to recall the pressure of being named after him. "One of my favorite stories," he shared, "would be that my goal in life early on was to walk down one side of the street and have my dad walk down the other side of the street, and have you walk down the middle and walk over to him and say, 'Are you really that guy's father?'" King never discouraged him from entering show business. 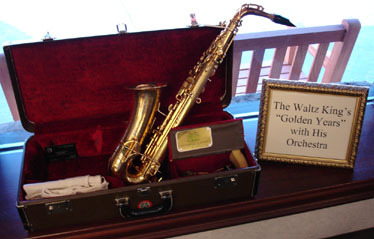 "No, in fact, my dad -- when I expressed interest in the saxophone -- he said, 'Fine,' and he gave me one of his saxophones that he didn't use and he said, 'Now, son I want you to play some scales on the saxophone. You're to do this for two weeks. I don't want you to do anything else but play these musical scales, if you want to learn how to play saxophone.' Well, I couldn't, I'm just not that type, I guess. And mom didn't help me 'cause she came up and said, 'You know, let's try Sawmill River Road or Red Sails in the Sunset and we didn't know, but just at that time, he came home and that's the last I played saxophone [Mrs. King and Wayne Jr. laugh]." Unlike those of other departed leaders, there will never be a band carrying on under King's name. "No," Mrs. King replied. "We were offered that." "He asked that we, the remaining family, destroy the music," Wayne Jr. revealed. "And we did. And the reason for that was precisely that. He did not ever want another Wayne King Orchestra without Wayne King in front of it. 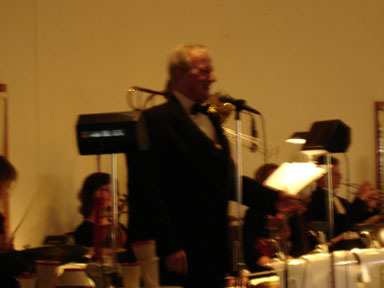 He was an integral part of the orchestra. He was the complete package with the orchestra, and that's the way he wanted the people to remember him." They certainly do, as shown by the hundreds of people who came out in 2004 to help honor his memory. "I think they do it because they remember their happy times, I think that's why," Mrs. King theorized. "Many of these people met at the Aragon and Trianon," Wayne Jr. said. "And I think everything he did, he did with decency. 'Cause there was nothing shady of any kind. It was just pure fun. And I wish we could get back to this type of thing in today's world." "I still love you," she answered, touchingly. "Well, I do love the man, will always love the man," Wayne Jr. agreed. "But I also want to say thanks to him, for providing some wonderful values . . . My home life was marvelous." It's obvious that a melody of love still flows in the hearts of his survivors. 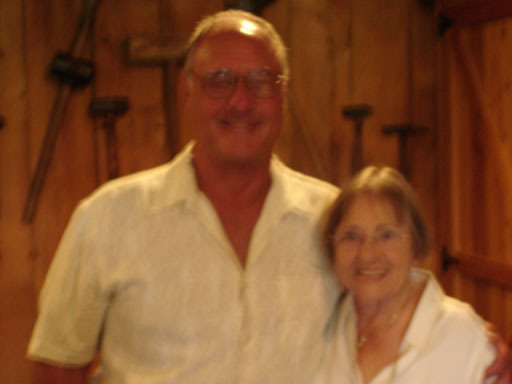 Sadly, musicians in the band with whom she initially worked, including longtime violinist Herb Miska, are now deceased. "Yes, unfortunately, they're all gone," she confirmed. "Not a single... I'm the only one. Even our driver of our bus passed away recently. And I'm it. But I was younger than any of them, and so that's why I'm here, I suppose." Today, she continues to hold King in high regard. too . . . I mean, like... you're gonna make me cry... He was that nice to me, his whole family was nice to me. I always felt like [a member of the family]." "Why? I can tell you why," Bolton continued. "I mean, he didn't say that, I'll tell you why: because it's when I grow too old to dream. That's bad psychology for the audience. Nobody wants to think they're old." "The thing that's very special about Wayne, I noticed when people would come in, they were downcast with the day's problems -- as we all are -- being human. By the time Wayne was finished with them, they were all smiling and laughing . . . "
So he asked King for his secret to success. "'You think love,'" Bolton said he was told. "'Before you go out on that stage, think love the whole time. Don't think of anything else but love, love, love, and you go out there and look at the audience, each one, transfer.' He said, 'It works like magic everytime!'" 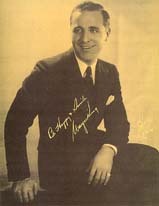 Wayne King's first recording, made in 1929, was titled, ironically, To Be Forgotten. He had long associations with the Victor and Decca labels, and his distinctive music continued to be recorded into 1969. "The sound of his band was big. It was full. 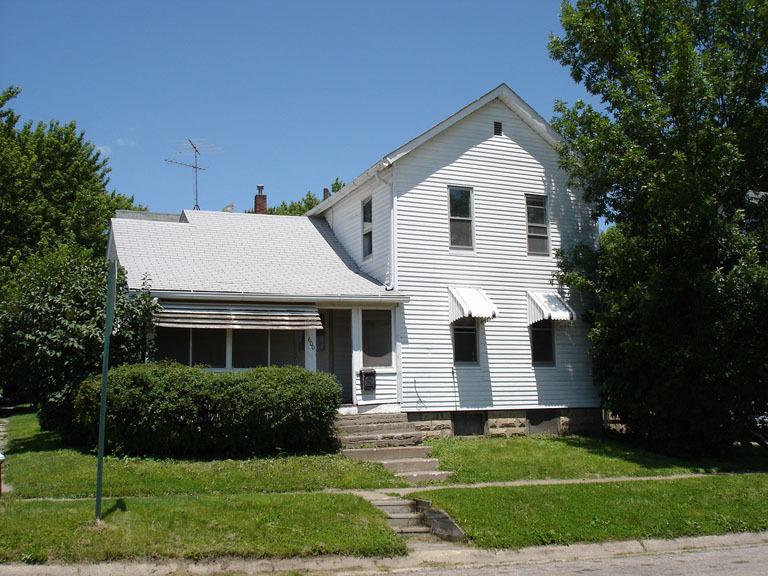 It was rich," Wayne Jr. pointed out. "And his was just elegant. There was a sound of his saxophone that I've never heard anyone else do. Never . . . He had his own style, he did what he did and he did it very well and that's what he wanted to do. He did appreciate other types of music. Some he didn't." Though King mostly stuck to the familiar melodies, new pops, such as Somewhere, My Love and Tie a Yellow Ribbon, made it into his music library. "He was always in the present tense," Bolton stated. "If somebody would say that's how it used to be, he didn't want to reminisce too much . . . He was right now, even though he was going up into his 80s, it was still right now." "I once asked him, 'How about the song my mother taught me?' . . . She was born in 1901, the same year he was born . . . [Bolton begins to sing] 'When I grow too old to dream, I'll have you to remember.' He said, 'No, I don't wanna do that.'" Newer faces filled the band for those latter-day appearances, including singer Ed Bolton, there from 1979 until the final trip in 1983. "At the Oak Brook Shopping Center [outside Chicago], there were like, oh my... I think it was over 10,000 people. I never saw an audience like that - I was dumbfounded!," he boasted. "And in Milwaukee, at the Eagles Club. It's a huge building there . . . thousands of people."